25 Feb 2015	My wife Mrs. Kumudavalli underwent a surgery for recurrent incisional hernia at MIOT International hospital. I can easily say that in terms of overall experience and comfort, MIOT is the best. I am Sowrirajan, Retired General Manager, Bank of Baroda. My wife Mrs. Kumudavalli underwent a surgery for recurrent incisional hernia at MIOT International hospital on 10th Feb 2015. My wife had already undergone 3 abdominal surgeries prior to the latest one – one hysterectomy and two subsequent incisional hernia. When she was to go for the third incisional hernia repair, naturally we were quite stressed. When we called on Prof. Dr. Surendran, HoD, HPB, he instilled a lot of confidence. His reputation had preceded him and no doubt he lived up to it creditably well. The extraordinary infrastructure –general ambience, cleanliness, comfortable room, etc. Truly international. I can say this with conviction as I had served in a couple of other countries and I have visited a few other countries as well. The infrastructure provides the first impression which is the best. Later we learnt that the O.T. and the post operative wards are also world class. The comfort provided by Dr. Surendran and his team of able doctors – Dr. Paari Vijayaraghavan, Dr. Ajitabh Srivastava and Dr. Vimalraj Velayudham. A big salute to the team. Very good nursing attention by the nursing team in MI 3rd Floor. While all of them were caring and were available at call, a special mention is to be made about sisters Jeevitha and Malar. Well, my wife had undergone the previous 3 surgeries at Chennai (not MIOT), Mumbai and Johannesburg (South Africa). I can easily say that in terms of overall experience and comfort, MIOT is the best. What can be more comforting than Dr. Surendran’s words that there won’t be a need for fifth intervention. Once again, our sincere thanks to you and your team. 04 Feb 2015	MIOT (International) is a great place to be at for treatment. Apart from all the state of the art facilities available I was specially happy with the human resource at hand. I am back home now well into my RR and am doing my best to recoup some weight and strength before I return for further chemotherapy. This is just to tell you that I am truly thankful to both you and and Dr S.Lakshmi Narayan for the care and cooperation you extended to me during my incarceration there at the Miot International. My overall experience there was more than satisfactory. The Miot is a great place to be at for treatment. Apart from all the state of the art facilities available I was specially happy with the human resource at hand. Doctors, sisters, technicians, office staff, down to the lift operating ladies were courteous helpful and did their jobs with a smile and kind word on their lips. Great work culture…and greater soft skills that you cannot train. It has to be inbred. During my correspondence with friends after my return here, a friend from Mumbai wrote to enquire if you were by any chance related to dr Jean Prabhu ( nee..Jean Coelom ). Please let me know so I can pass it on. Looking forward to seeing you soon. 19 Jan 2015	About MIOT, amazing facility, equipment, arrangements etc. It worth every single penny we spent. Please extend our gratitude to the MIOT management. It couldn’t have been better than this. My family, especially my father, wanted to extend a big thanks to you. Both of you did a wonderful job!!! We came to MIOT with lot of anxiety. Because of our previous meetings with well know cardiologist in Gujarat and attempt to put graft by radiologist in Mumbai, we knew our sister had a very complex and life threatening aorta problem. Before reaching your office we did search on internet about you and MIOT. We read all positive feedback. Finally, when we entered your office our worry was gone. An ever smiling face and a rock solid confidence of yours, ensured we are at the right place. Smile on doctor’s face heals half the pain. Before surgery I met a person who was serving at Indian Information Broadcast in Delhi. He told story of his 90 year old sister whom you operated successfully. Her case was rejected by all the hospitals in Chennai. That boosted our confidence further. Finally it was the day of operation 4th August 2014. Our sister was taken to operation theatre around at 7:40. We waited ……..it was at 6:45 when I was called to your office to confirm the news of successful operation. You are the best doctor we have ever met. We will not forget for rest of our life your smiling face, compassionate and kind way to treating the patient and the relatives. In spite of super busy schedule you were always approachable. Your passion to help needy people is amazing. Please keep helping them. Your team, we have no words. Julius, Mustafa, Gananakani, ICU staff. Best bestbest people in the medical field we have met. Ever ready to help. You all are so down to earth. From bottom of our hearts we pray to GOD almighty to give you best of the reward and success to all of you. About MIOT, amazing facility, equipment, arrangements etc. It worth every single penny we spent. Please extend our gratitude to the MIOT management. It couldn\’t have been better than this. Sir, we stand and salute your parents who must have worked hard to make you what you are today. A super doctor and above all a kind hearted person. A big thanks to your families as well. I can keep praising endlessly….. I will fall short of words. Again, thanks for saving my sisters a new life. She is doing really well. I also take this opportunity to wish you a very happy new year. Thanks a lot!!!! 19 Jan 2015	My mom underwent a successful liver transplant. Coming here, I thought the most amazing thing that could happen was seeing mom getting back to her normal life. One of the most interesting things about the Bible is how certain verses spring to life depending on the setting you are in and what\’s happening around you at the time. The verse quoted above is one such example. I have come across it many timesin the past, but never has it spoken to me as much as it has over the last three months and it continues to hold true and strong even now as I write this email. 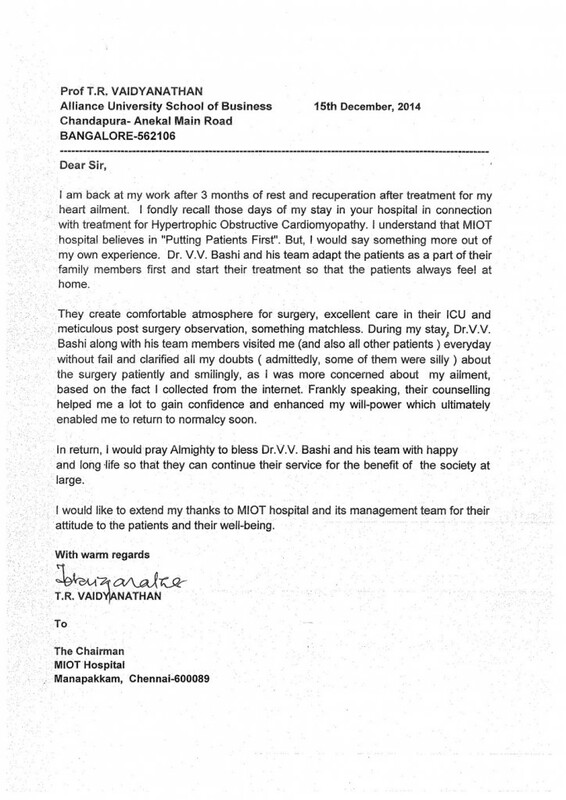 I’ve been in Chennai since Sept 14th – a week after my mom underwent a successful liver transplant. I haven’t had the chance to share news of my departure and all the progress here with a lot of you so thought it best to send an email to keep everyone informed. Mom’s surgery took place on the 7th of September and every day since has been a gift. We have been witnessing God’s awesomeness each day throughout mom’s recovery process. Coming here, I thought the most amazing thing that could happen was seeing mom getting back to her normal life – which I did. Peace of mind and assurance – throughout the time mom was in Chennai. For such a major surgery there was peace that we all found solace in. Fast forward to a few months later and we are back in Kerala. In a mere 80 days post-surgery, mom was running around the house as if she had put it allbehind her. She was going for regular walks and making me a cup of tea in the evening along with hers. And I thought to myself at the time that victory was surely ours while the battle belonged to our Lord. In all of this I know we are not alone. Not so long as we serve a livingLord and Savior. He has been a provider, shelter, healer and redeemer throughout all of this. call happen. That in itself was a huge blessing as the right match was critical and it was what everything that was to follow hinged on. God was preparing us for his time. In a city completely foreign to us (Chennai), Godused his people to take care of all our needs. 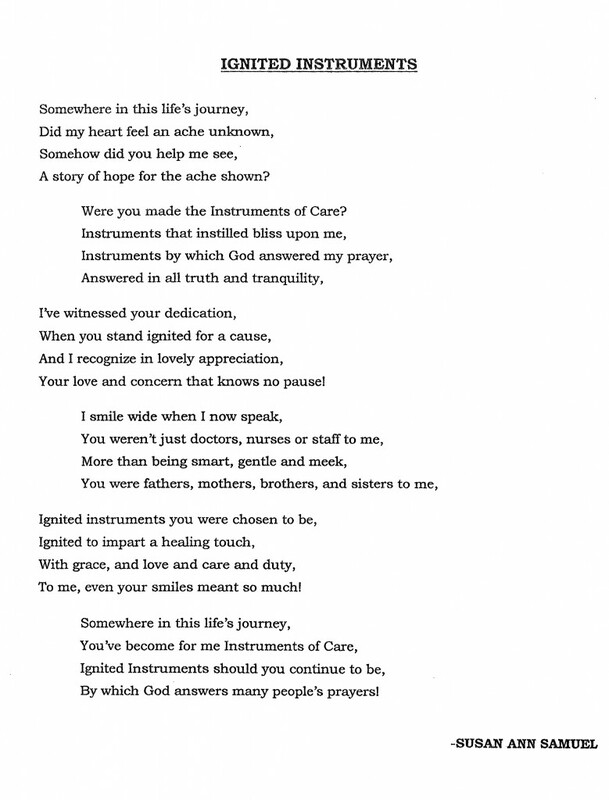 We found care and support inthe hands of a highly qualified and competent team at MIOT and a physician who too was a man of God. Through one home and avenue he led us to everything we needed at every juncture. Mom was able to recover in a good clean home in Chennai where we got plenty of support physically, emotionallyand spiritually. We had a church and believers praying for us round the clock. Mom\’s healing and recovery was a great success. I noticed that Mom never showed signs of fear or doubt. She always told me that she knew Jesus was holding her hand – even when she was being wheeled into the OT for her surgery. Everything discussed about God’s awesomeness will hold once again and we will reflect on the great things he has done for us even in times like this. This time again, we will be patient, persevere, endure and march in the risen Lord\’s name because this is what we do. 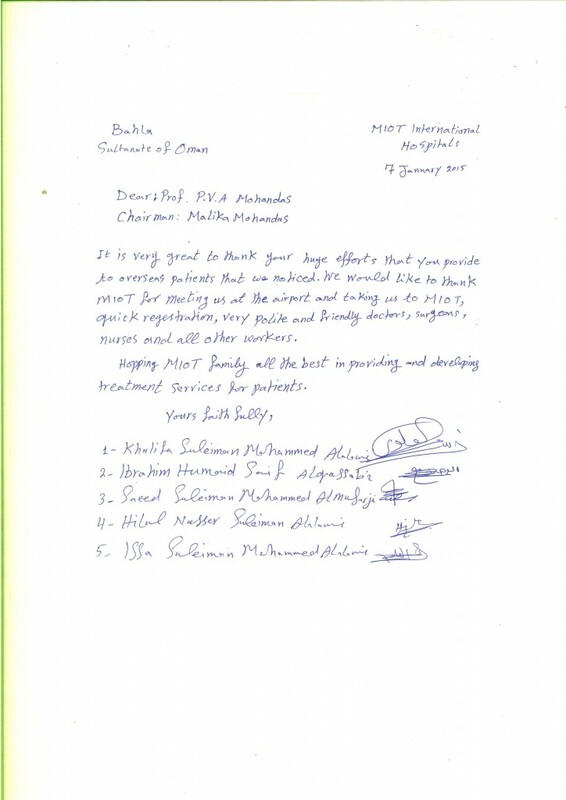 12 Jan 2015	We've received compliments from our overseas patients. 30 Dec 2014	Thank you and your team of doctors, nurses and other staff for having brought me back to the normal life in a short time. TRAINED DEDICATED FULL TIME DOCTORS. Thank you and your team of doctors, nurses and other staff for having brought me back to the normal life in a short time. And especially your personal visit when I was in hospital. May Christ help you continue in your good work to the human race.